L'Allée du Roi (The Avenue of The King), by Françoise Chandernagor. The TV-film with the same title was released in French in 1996. It has a playtime of 4 hours. Director: Nina Companéez Writers: Françoise Chandernagor (novel), Nina Companéez Stars: Dominique Blanc, Mauricio Buraglia and Didier Sandre. The King's Way (French: L'Allée du Roi) is a novel by the French author Françoise Chandernagor first published in 1981. It is the story of Françoise d'Aubigné, marquise de Maintenon, who in the 17th century was almost the queen of France. It follows her destiny, from her birth in a prison in Niort and her poor childhood, to a marriage to a disabled poet, and her life in the court of Louis XIV, king of France, where she became his companion and finally his wife. That film was released only in France and only in French. It is possible to buy it on DVD or on VHS. The playtime of the film is 4 hours - it was produced for TV! 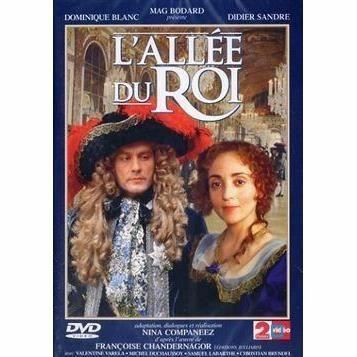 That is a really great film about Louis XIV and his age! It starts as Francoise d'Aubigné (future Madame de Maintenon) marries her first husband - the writer Scarron and ends with death of Louis XIV. As you see that film covers a very big part of Louis' life. 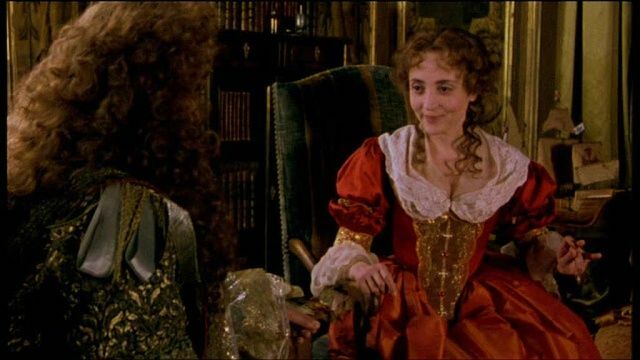 Mainly that film is about Madame de Maintenon, but as we follow her everywhere we meet all famous people - Madame de Montespan, Louis XIV, Louis' Ministers, Queen of France and we visit Versailles, Maintenon and some other great places. That film really provides the atmosphere of the 17th century and it makes its best to show us Louis and his court as close as possible. The costumes, decorations and locations are great! I would highly recommend it to everybody who wants to see the court of Louis XIV, the realization of that film is very good.